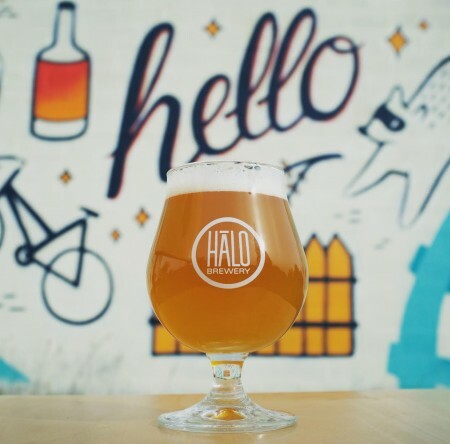 TORONTO, ON – Halo Brewery has announced details of a new limited edition variation on one of its more popular brands. Never ones to shy away from bold flavour and aroma, Halo’s brewers wondered how they could get more of it out of New Wave IPA. It turns out doubling the already large amount of dry hops was just the answer. Double Dry Hopped New Wave showcases the intense creamsicle, orange pith and tropical fruit flavours from some of Halo’s favourite hops — Amarillo, Mosaic, Citra, Centennial and Columbus — while maintaining a restrained bitterness. Double Dry Hopped New Wave IPA will be released tomorrow (October 28th) at 3:00 PM at the Halo taproom and retail store in a limited run of 500 ml bottles, with a purchase limit of 4 bottles per customer.